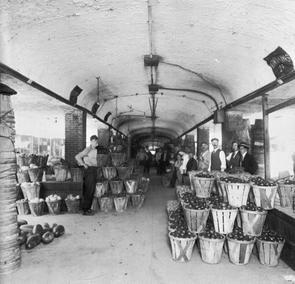 Market House between Fairmount and Poplar, showing men and containers of produce. "Still Philadelphia: A Photographic History, 1890-1940" Miller, Fredric M., Morris J. Vogel, and Allen F. Davis. Philadelphia: Temple University Press, 1983, p. 86.